It's late Fall. Most of the leaves are on the ground now, creating a gold and orange carpet. There are four large boulders next to the trail. These boulders are usually inconspicuous - nothing of note. But after just a few rains, these same boulders become a source of delight, decorated with the moss and ferns which sprout up seemingly overnight. This particular morning was quite foggy. But as I walked, the fog began to thin out, and sunlight came through. 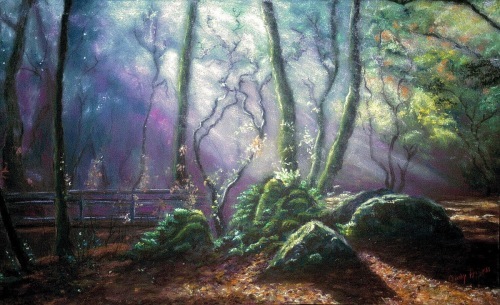 The shafts of sunlight really did illuminate those boulders just as shown in the painting, and effect was stunning. It truly was a magical moment. Though the original is in pastels, the fine art giclee reproduction is done on the highest quality satin finish canvas, and therefore looks very much like an oil painting, with deep and brilliant color. You have your choice of sizes. My husband and I took our dog to the beach one cold and windy day. Dark clouds hid the sun, while flocks of pelicans flew by. I happened to glance upward, though, at a key moment: The clouds had parted in one particular small area, forming a circle around the sun, while three pelicans traversed in front of that opening. What a magical moment that was! The intense sunlight reflecting onto the surrounding clouds, with just a patch of blue sky showing. And then there were the birds, which seemed to me to be flying out of the darkness and straight into the light. From darkness to light, from despair to hope and redemption is probably my favorite theme, and the one I most frequently portray in my paintings. 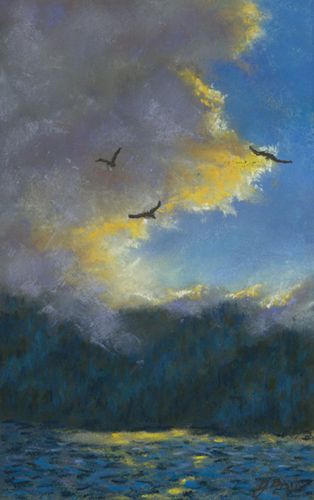 Just a word here about my use of color in cloud paintings: I never use pure black/white grays. Instead, my clouds are composed of other real colors which are grayed-out. My feeling is that the clouds look more alive that way. At least, it satisfies my personal aesthetic. This is part of the street where I live. We have many Bay Laurel trees in our area, and you can see a part of a giant mature one in the foreground. Large oleander bushes of pink, white and red are visible on the right. The street dead-ends at forested open space where I have walked my dogs for many years, so I am very familiar with it's colors and moods. This particular morning was strikingly different than most. It was quite foggy, which in itself was not unusual. But the fog was transluscent enough to allow for sunlight to pierce it. This formed the strong shadow patterns on the street, and the mystical shafts of light through the trees further down the road. It is a yet another reminder of one of my favorite life lessons: if we keep on going through the dark places, we will eventually emerge into the light. It's just right up ahead. When I began my walk around this lake on this morning, my view was obscured by a heavy blanket of fog, so the colors of the surrounding vegetation were dull and grayed out. This is not the kind of scene that I like to photograph or paint. But as my tour around the small lake concluded a half hour later, I noticed that the fog was beginning to lift. The sun was now filtering through the fog, illuminating some of the vegetation. Reflections were now visible in the very still waters, part of which was still hidden in the mist. I was especially entranced by the gorgeous reflected patch of blue sky. The whole scene I had a mystical quality, which I hope I have captured for you. 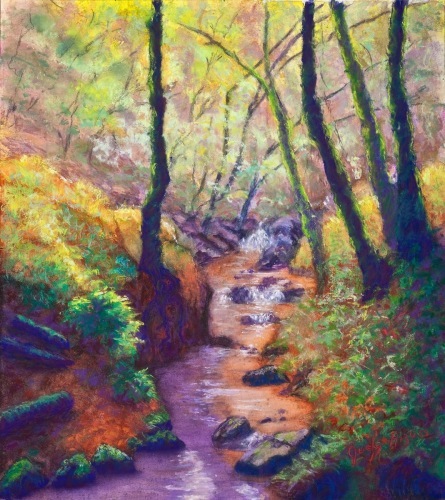 Though the original is in pastels, the fine art giclee reproduction is done on the highest quality satin finish canvas, and therefore retaining the brilliance of the original pastels, but also looking very much like an oil painting. You have your choice of sizes. This small creek, which feeds into a larger creek, is a hidden gem in our canyon open space - a place for quiet contemplation. Although heavily forested, the light of the sun does shine through, magically lighting up the ferns and other vegetation. Especially after the first rains of fall, I love the brilliant emerald green shades of moss and ferns, contrasted against the golden colors of fallen leaves, and the deep reddish brown earth tones. To begin painting, I underpainted the background in pinks and mauve as a complement to all of the greens. I'm fortunate to live across the street from this magnificent Japanese Maple. Barely noticeable for nine months of the year, it comes into its colorful splendor during the cool Autumn months - and then you can't help but notice it. The leaves really are that orange! The tree begged to be painted, so who was I to refuse? I settled on a dark blue-violet background to help the oranges really stand out. This painting began with an idea of motion. I literally moved my arms in a sweeping gesture, reaching outward and up. I wanted this movement to portray a reaching and expansion of one's Self beyond previously-known boundaries. 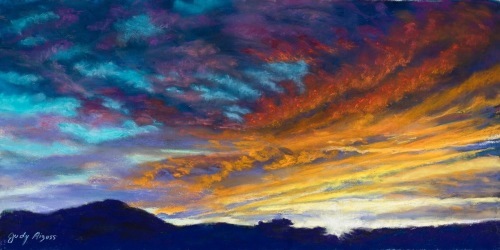 Paradoxically, I conceived of and painted this sunset during a prolonged and difficult time in my life. But the painting that emerged showed me that my expansive soul is still very much alive and present, regardless of how I'm feeling physically or emotionally. Perhaps the image can be a message to you, as well - a reminder of the life force within you, regardless of what is happening with your life or the condition of your body. I revel in creating gradations of colors that enhance each other, while also expressing what I am feeling inside, and what I want viewers to feel. Each color has a different energy signature, and when they are combined they create great excitement, evoking different emotions and sometimes even heightened states of awareness in the viewer. 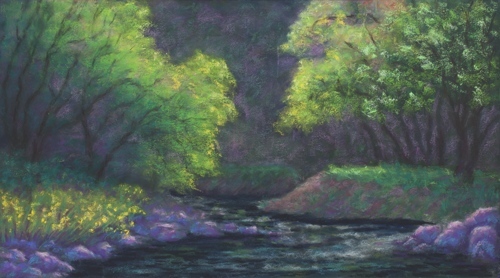 The original of this painting was done in pastels. The color effects are achieved by first underpainting, and then by layering the colors and blending. I used a combination of several reference photos and my imagination. 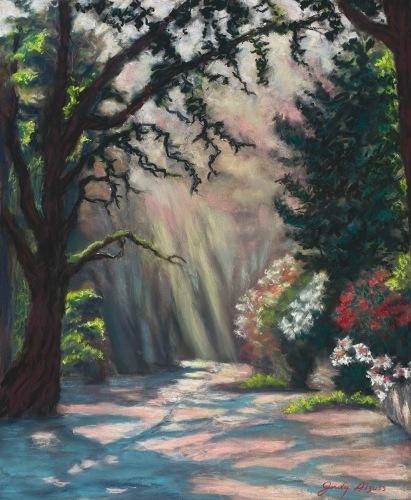 Though the original is in pastels and has been sold, the fine art giclee reproduction is done on the highest quality satin finish canvas, and therefore looks very much like an oil painting, with deep and brilliant color. You have your choice of sizes. This is Escheveria 'Afterglow' - a spectacular succulent growing right outside my front door. It's close to a foot wide. 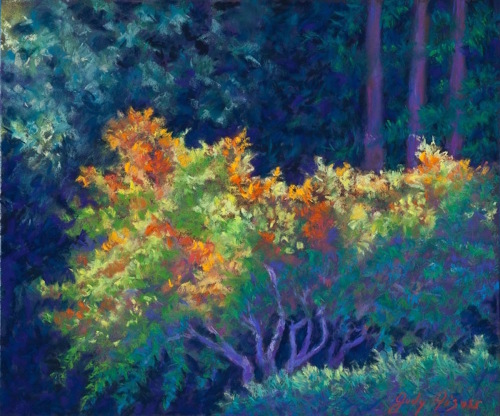 In the late afternoon, the sunlight shines through the transluscent leaves, heightening their many subltle colors - blue -gray lavenders, oranges and yellow. I chose to paint it using a contrasting dark background to heighten the show. 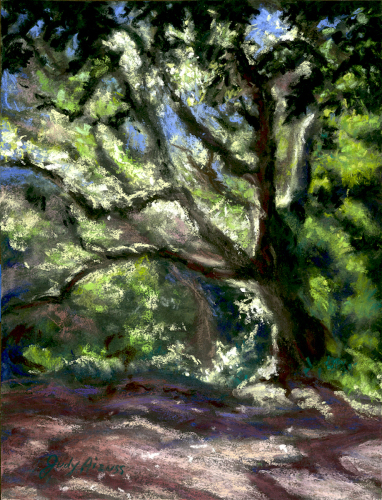 The original of this painting was done in pastels. On weekends, this lake is a popular destination for hikers, mountain bikers, fishermen, and picnicking families. But on weekdays, the lake and the land are returned to the creatures that live here. Turtles climb onto the logs, salamanders and snakes can safely cross the paths, and the only ones doing the fishing are the great blue heron‘s and snowy egrets. Herds of deer can be seen grazing on the hillsides. My aim with this painting was to capture the peacefulness I not only saw, but felt as I witnessed the grandeur and beauty of it all. The last portion of my hike this day was through a shaded passage. It was made dark by the canopy of trees and dense vegetation on both sides of the road. But it was a sunny morning, and a bright “hole” of sunlight was clearly visible where the trees stopped and the meadow began. The scene reminded me of a wonderful song by Gordon Bok called “Turning Toward the Morning”. Bok reassures us that even in the cold, bleak winter the “world is always turning toward the morning”. We all have dark ‘winters’ in our lives, but during those times the morning - and the light that comes with it - is ahead. Hence the tittle of this painting: “Toward the Morning”. Most of the painting is taken up by the darkness, but I purposely did not make the dark ugly. The dark is infused with luscious blues, greens, magenta and purple : a reminder that dark times can be rich and have their own beauty. 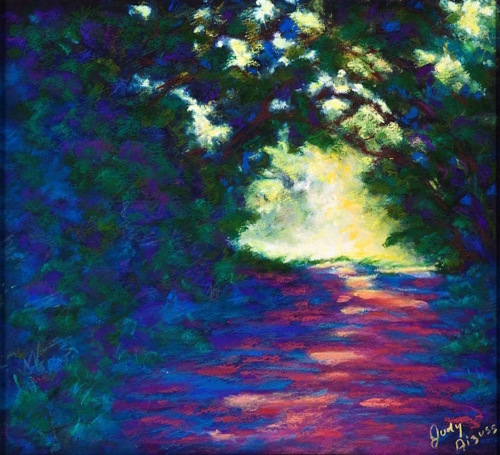 There are also flecks of sunlight on the path, acting as guideposts to the light and inspiring us to keep moving forward. 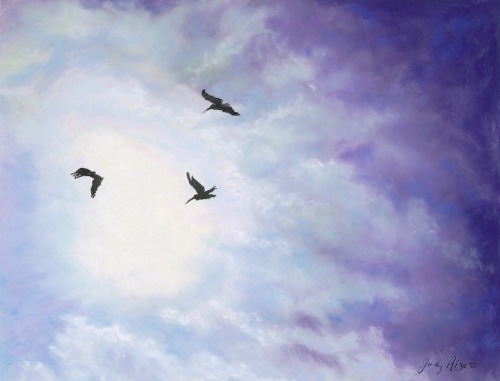 These are the same pelicans I used in "Take Flight", but this time I positioned them so that they are flying right into the sun. 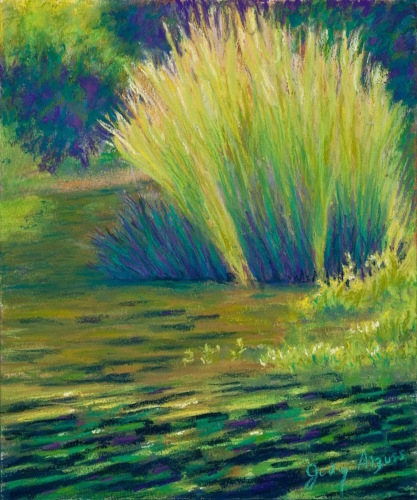 In this painting, I was interested in capturing, as best I could, the subtle gradations of rainbow colors we see if we glance - just for a second - directly at the sun. Those colors also infuse what we have come to call the "silver lining" of dark clouds. 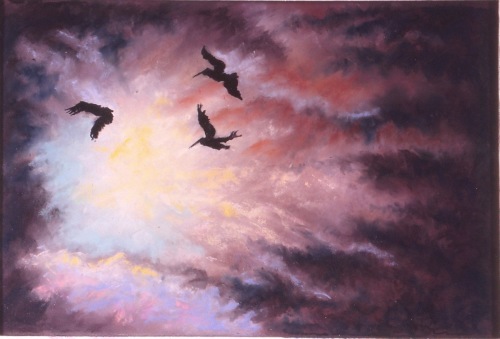 The pelicans are flying out of the violet darkness, and toward the light - as I believe we all are. 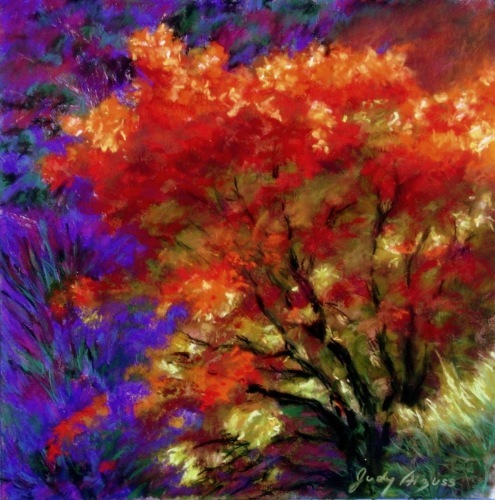 Though the original, which was sold, is in pastels, the fine art giclee reproduction is done on the highest quality satin finish canvas, and therefore looks very much like an oil painting, with deep and brilliant color. You have your choice of sizes. 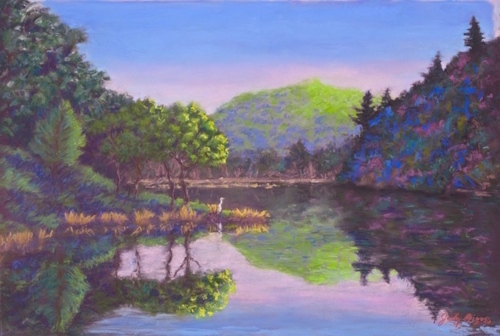 What inspired me to paint this scene was first, the movement of the water and the many colors reflected in it. For me, the many shades of green are both soothing and healing. But I am also inspired by the dramatic upward reach of the tall grasses. They speak to me of movement and growth, as well as proclaiming an exuberance for life! 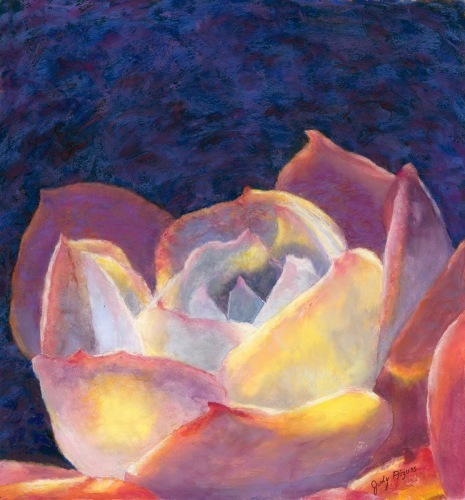 Though the original is in pastels, the fine art giclee reproduction is done on the highest quality satin finish canvas, and therefore looks very much like an oil painting, with deep and brilliant color. This Japanese Maple is one of my muses. It's right across the street from my home, so I can gaze at it from my living room window to witness all of it's moods through the seasons, Here it is in early Fall, with the green leaves gradually turning to brilliant oranges and yellows. The afternoon sun is hitting the tree, lighting it up even more. I chose a cool violet tone for the trunks, as a complement and contrast to the warm leaf shades. Though the original is in pastels, the fine art giclee reproduction is done on the highest quality satin finish canvas, and therefore looks very much like an oil painting, with the same deep and brilliant colors as the original. You have your choice of sizes. A small group of very old oak trees stands together next to a hiking trail, near the shore of a lovely lake. You don’t see the trees, though, until you turn the corner from a wide fire road onto the smaller trail that will take you around the lake. On this particular morning walk, I was greeted by a delightful surprise. Sunlight illumined the trees and surrounding vegetation in a way that I’ve never seen before or since. My mind – my awareness – was illumined as well, lifted from the ordinary to the extraordinary. This moment occurred years ago, yet I have never forgotten it. It had to be painted. The dry summer grasses and oaks on this Northern California ridge-top become infused with brilliant orange shades at sundown. The cares of the day slip away as I walk along this fire road with my dog, greeting other walkers with their dogs. No one is in a hurry here, and everyone has a smile and friendly greeting to offer., as the magical beauty of the scene is healing for all. This is a mixed media piece: the original was done in mostly pastels, with acrylic underpainting and also acrylic inks and even watercolors. My muse here is a Japanese Maple on my neighbor's property which I get to see out my living room window every day. 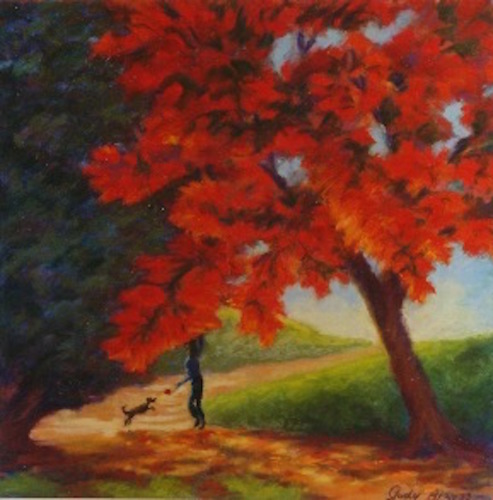 But for this painting, I went up close and underneath the maple. All the leaves were in the shade, but gazing upward was this patch of intense sunlight coming through, communicating the recurring message that Light is always present when you look for it. And as always, even the darkness - in the case, the leaves - has its own beauty. Sizes and costs of prints will be posted in a few days. The creek runs through the canyon open space next to where I live, so I've taken walks through the area for many years. 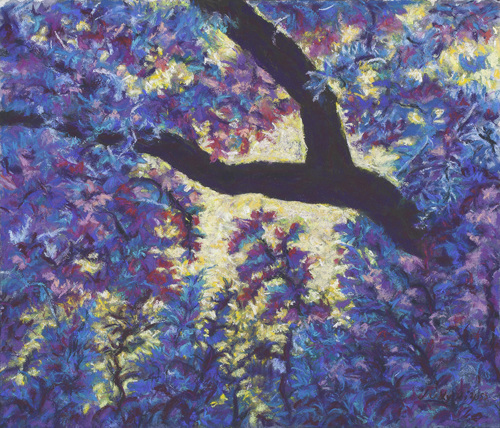 This painting was inspired by an early Spring evening - a sacred moment when the setting sun kissed the overhanging trees. The original is done in pastels. I love bold and brilliant colors, and I particularly enjoy the way purples, blue and magenta play off of various shades of green. SIZES AND COSTS OF PRINTS WILL BE POSTED SHORTLY. This is a view of one one of the Northern California lakes local to us. Being not far from the ocean, we often get thick fog which rolls over the hills. On this evening, large clouds combined with the fog. Seagulls travelled inland from the coast to get away from the more severe weather. Dark clouds - especially when the edges are lit up by the setting sun - embody a powerful reminder that even in the darkest of times there can be awe-inspiring beauty as well as hope and a promise of light to come. Is this a real scene? Well, "Yes" and "No". The hills around the lake really look like that. They glow when the sun is setting across from them. And in the Springtime, the grasses are covered with lupines and poppies, which in this painting, are in the foreground and more shaded than the background hills. The lupines, when studied up close, show stunning variations of violet, blue and magenta. My friend, who is a gardening professional, tells me that the lupines get their color variations from bee pollination. What a gift! 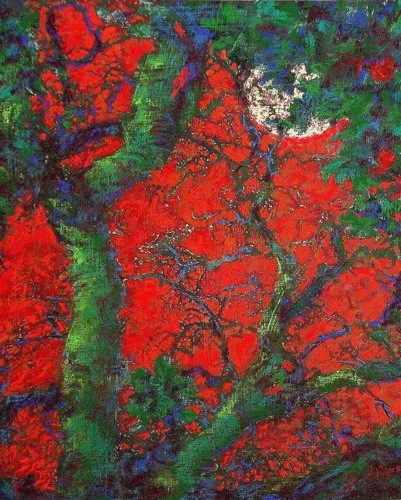 All of those colors can be seen in this painting. As for the oranges and golds on the trees which cover the hills - those are Madrones trees, which are native to this area and are considered by many to be sacred. And yes, I did exaggerate the colors. I did that in order to communicate to help you feel the quiet awe and peace I experienced while witnessing this gorgeous scene. This huge old Valley Oakgrows right outside my bedroom window. I spotted a good composition by photographing just a couple of branches. I am always drawn to the moss which appears on the tree in Winter (this is California, so we don't get snow here). Contrasting the green moss with a red background brings the tree front and center. The moon in the background is a whimsical touch I decided to add. I had never seen a cloud formation like this before, or since. The view was from a ridge top, gazing over the valley to the distant mountain: our beloved Mt. Tamalpais. So the dark "rock" you see above the grasses is actually a mountain. The fast-moving clouds carried by driving wind were bringing a shower of hail, which soon reached the ridge on which I was standing. The atmosphere was filled with excitement! This is another interpretation of the fast-approaching hailstorm which I got to view from a ridge-top. I had never seen anything quite like it - then, or since. For me, the turbulent cloud formations show us not only the ominous power of nature, but also symbolize how small we are, and at times, seemingly powerless in the face of circumstance. That said, the storm clouds are also showing us the equal power of light shining through all of that darkness, which is one of my favorite themes. Light is a promise, and Light is always present no matter how dark things appear to be. Note: Larger custom sizes are available. Contact me for pricing.